There are a healthy number of capable subwoofers out there. Nearly every manufacturer of repute makes at least one, and the leading brands generally offer at least one in each of their loudspeaker lines. These days, however, JL Audio is usually one of the first -- if not the first -- names mentioned when someone is looking for “the best” sub. When JLA announced their new Dominion line of entry-level subs, the 8” d108 ($799.99 USD), and 10” d110 ($999.99), I jumped at the opportunity to partner my KEF LS50 minimonitors with a d108. JL Audio, based in Miramar, Florida, and now 41 years old, made their start in car audio. Beginning in the mid-1980s, the company’s various W-series drivers earned it a reputation for bass authority. Then, in 2001, JLA introduced its W7 subs, and these formed the basis for their first subwoofers for the home: the epic Gotham g213 (the g213 v2 currently retails for $15,000), which has a pair of 13.5” cones in a solid-fiberglass enclosure with a half-moon cross section; and the more traditional but no less impressive Fathom line ($2799.99-$6999.99). It wasn’t until 2013 that JLA created the more affordable E-Sub line, in the forms of the 10” e110 ($1499.99) and 12” e112 ($1899.99). For offering substantial sound for the money, the E-Subs earned rave reviews from SoundStage!, The Abso!ute Sound, and others. 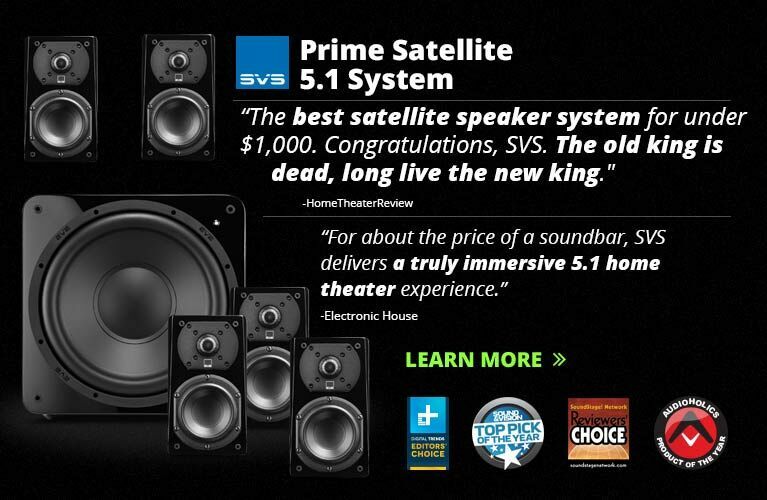 But there are countless subwoofers available for under $1000, including many with bigger boxes, larger woofers, or both. 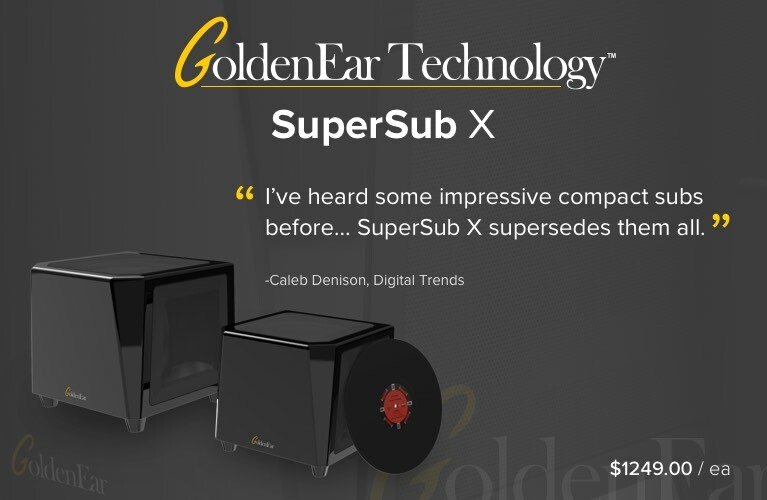 In a subwoofer, square and cubic inches matter, and JLA’s new baby sub is no bruiser. The Dominion d108 is compact, measuring 11.4”H x 10”W x 13.2”D -- less than one cubic foot -- and weighing a modest 26.4 pounds. Like JLA’s more expensive subs, it has a sealed enclosure, this one made of MDF. Removing the front grille reveals a single 8” cone with an “effective piston area” (JLA’s term) of 32.2 square inches, and a massive rubber surround. This, combined with an “effective displacement” of 80 cubic inches, makes it clear that this little guy relies on long driver excursions -- in excess of 2.5” from peak to peak -- to meet its impressive specified frequency response of 31-112Hz, ±1.5dB, with a -3dB point of 29Hz and -10dB at 21Hz. What’s more impressive is that this frequency response was taken in an anechoic chamber, not a listening room. The Dominion d108 is powered by a 500W RMS (short-term) class-D amplifier, and its cabinet is finished in Black Ash (add $100 for Black Gloss). The drivers and amplifiers used in the Dominion line are not off-the-shelf parts, or even derived from components originally designed for other JLA models. Instead, they’re unique models designed from scratch. It took roughly two years for JLA’s engineering department in Miramar, and their electronics lab in Phoenix, Arizona, to respectively design the d108’s driver and amp. JLA uses cutting-edge finite-element analysis to design its famed, deep-dish woofers, and brings multiple patents to bear on their motor structures, including a proprietary venting collar, a technique to bond the cone and surround to the voice-coil, and special wiring leads. JLA manufactures its components and assembles its subs at its factory in Miramar. Along the bottom of the rear panel are the usual suspects: unbalanced RCA inputs, high-level speaker inputs, a Wireless Link, an IEC power inlet, and an input-mode toggle with settings labeled Grounded and Isolated. Above these are a substantial heatsink and the all-important controls for proper subwoofer integration: a low-pass filter switch, a low-pass frequency knob (25-130Hz), a Master Level knob, a variable Phase control (0-280 degrees, ref. 80Hz), and a Polarity switch (0 or 180 degrees). Overall, the Dominion d108’s fit’n’finish are very good, and the Black Ash vinyl wrap of my review model was attractive. The sub’s feel is rock solid. Some budget subs look and feel as inexpensive as they are, but the baby JLA isn’t one of them. Its front grille is unobtrusive, but I ditched it for most of my listening so that I could watch the Dominion’s driver do its high-excursion thing. Small enclosure volume creates enormous challenges. That really cannot be overstated. The driver and amplifier work much harder in smaller air chambers than larger ones, with driver stability and linearity being huge challenges. Heat is another factor. High power amplifiers driving robust moving assemblies in a small air space cause heat to build up with no place to go, so extensive engineering and thermal testing are a necessity. Most companies resolve stability issues by simply making a very stiff suspension at the expense of linearity. The problem with the stiff suspension approach is that the sonic result is “one-note bass” and poor low frequency extension. 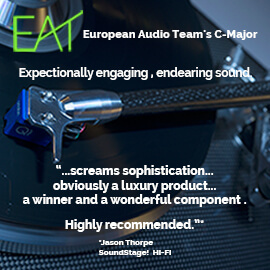 We are very proud to achieve audiophile results in these tiny enclosures where physics are working against you. A truly musical subwoofer for $799.99? Quite a claim. Integrating a sub into a home-theater system with a modern A/V receiver is one thing. Seamlessly uniting a pair of bookshelf loudspeakers with the Dominion d108 via a pair of DAC-integrated amplifiers is something else entirely. At my place, the little JLA first did time with Parasound’s Halo Integrated, which luckily includes built-in bass management in the form of high- and low-pass subwoofer controls. This allowed me to bypass the sub’s built-in filters. At first, I found the best synergy by setting both of the Parasound’s filters, which use second-order (12dB/octave) slopes, to 80Hz. This proved adequate, but I never found quite the synergy I was looking for. I kept dialing back the JLA’s output via the Parasound’s front-mounted Sub Level control, but I couldn’t stop it from sounding a touch flabby, boomy, and overcooked. I consulted the Dominion d108’s excellent manual, which instructed me in how to dial in the d108 to the requirements of my particular setup. My system is arranged along the long wall of a narrow city home with an open floor plan, and the space has several wicked bass modes that make anything like neutral bass reproduction very difficult to obtain. I found that setting the d108’s Polarity switch to 180 degrees helped smooth the bass response in my unhelpful room; I left the Phase control at 0 degrees. When I hooked up the Dominion d108 to my reference DAC-integrated, a Hegel Music Systems H360, I used the Hegel’s variable RCA outputs. Without the benefit of built-in subwoofer management, and no high-pass filter to let me cross the sub over to my LS50s at a frequency of my choosing, I used the JLA’s built-in low-pass filter, which has a fourth-order (24dB/octave) Linkwitz-Riley alignment, to set a crossover frequency of 80Hz. I turned down the d108’s Master Level knob to 10 o’clock, and left the Polarity switch at 180 degrees. As with the Parasound Halo, I wasn’t totally satisfied with the results: the upper bass was a bit too ripe, likely because the LS50s were now running full range. I set the crossover frequency to 60Hz, and finally got the harmonious continuity of sound I’d been searching for. Here’s what the Dominion d108 didn’t do. This little sub was no punishing brute that shook my floors, rattled my light fixtures, and unsettled my kidneys. That’s the domain of JLA’s 10” Dominion, the d110, and their costlier E-Sub models. The d108 was more a tactical weapon for use in a few specific types of systems: the ultimate desktop setup, nearfield monitoring, and rooms of small to medium size. I can envision the d108 being a perfectly suitable partner for a small home theater, but I predict that it will most often be used as I used it: in a 2.1-channel system with a pair of minimonitors, or with small two- or two-and-a-half-way floorstanders. Despite being unable to take advantage of a proper bass-management system, I was plenty satisfied with the Dominion d108’s sound in my room. The little LS50s are ridiculous overachievers capable of impressive soundstaging, surprisingly punchy upper-bass output, and a midrange clarity that punches far beyond their price of $1499.99/pair. Any two-way speaker has limitations, however, and despite sounding full-bodied, its bass performance will never satisfy in the way a proper three-way will. Crossing the d108 over to the LS50s at 60Hz and dialing back the sub’s volume control to 10 o’clock proved to be the sweet spot for my room: the midbass was virile, punchy, and well controlled, and the low-end extension was respectable. I began with “Day N Nite (Nightmare),” from Kid Cudi’s Man on the Moon: The End of Day (16-bit/44.1kHz ALAC, Motown), a favorite track for the full-throttle bass synthesizer that begins it. It provides a whomping, solid foundation for Cudi’s voice as he raps about his uncle, who’d died when he and his nephew were on bad terms. The bass shot easily has energy down below 40Hz, and the d108 sounded as composed and extended as some of the tower speakers I’ve reviewed in the last few years. Any concern I had about the ponderous one-note bass produced by so many other affordable subwoofers vanished when I heard the d108’s tightfisted control. Its pace was commensurate with what I heard from the LS50 themselves below 100Hz: relatively quick and supple without being overpowering. From the first notes, mission was, as far as I was concerned, accomplished: The d108 neatly filled in the octave or so below what my speakers can muster on their own. Which is all any subwoofer is supposed to do. When I played another favorite track, “Air,” from Hans Zimmer’s score for the film The Thin Red Line (16/44.1 ALAC, RCA Victor), the d108 ran up against some of its limits. This track features massive taiko drums being struck in a large space, and while the little d108 proffered strong low-end extension, it eschewed outright power in favor of a more professional presentation. The texture of the drums was articulated with more of a punchy quality than with the visceral slam that more substantial subwoofers and big floorstanding speakers can produce. As noted above, it’s not easy to get deep, controlled low-bass output from so small a box, and even a company of JL Audio’s experience and expertise can’t defy physics. Still, in my medium-size listening room with its problematic bass modes, the taiko drums resounded fully without sounding bloated. For a more rollicking time, I turned to “Dreaming of the Crash,” from Zimmer’s score for Interstellar (24/44.1 AIFF, WaterTower Music/HDtracks). Halfway through this track is a sustained mid- and lower-bass line that crescendos to a punishing wallop of sub-50Hz energy. Trying to keep up, my little KEFs’ 5.25” midrange-woofers pulsed with an adorable inch or so of excursion -- but it was downright inspiring to watch the JLA’s 8” woofer just about drive itself out of its enclosure. Though its cone moved violently in and out, the sound of the d108’s driver remained cool under pressure, delivering strong bass down to around 30Hz, at which frequency its output promptly fell off a cliff. I did feel the little Dominion quite a bit from my listening seat 8’ away, but not in any profound way. The d108 played as loudly as I was willing to push the KEFs: a sustained 92-93dB measured at roughly 1m with an SPL-meter app on my iPhone. Past a certain point, the Dominion excited my room so that I was hearing more of my room boundaries than the sub itself, but at my max volume of +93dB, the sub seemed to be struggling at the lower limits of its abilities: its normally athletic response became a touch loose. Still, I was asking a single 8” sub to push past 95dB peaks in a medium-size listening space. The remedy is simple if costly: Buy a bigger sub or a second d108. Two Dominion d108s might just be perfect for the ultimate small home theater or listening room, where a lack of room volume really prohibits the use of a subwoofer with a driver diameter exceeding 10”. JL Audio’s Dominion d108 is a truly musical subwoofer with enough refinement and control to keep up with a top-flight minimonitor, and is ballsy enough to provide robust output down to 30Hz. It faces stiff competition at its price of $799.99, which may well buy you a bigger, brawnier sub from a competing brand, but the JLA never sounded less than excellent in my suboptimal room. 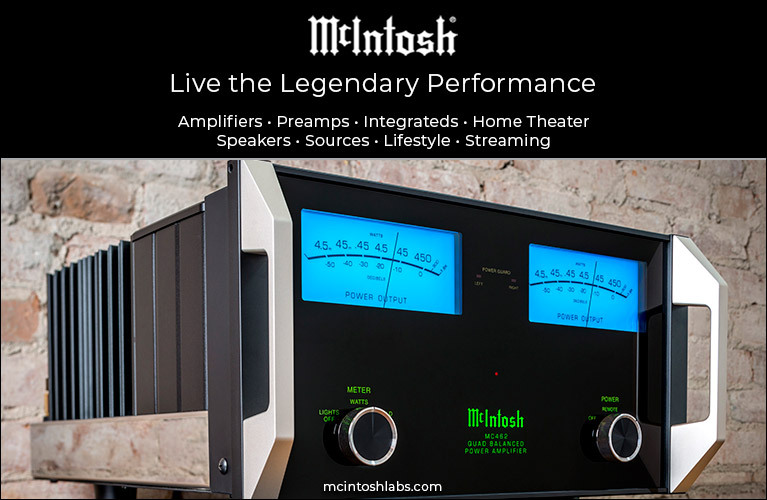 The Dominion d108 could be part of the ultimate 2.1-channel system for the common audiophile. Given the level of performance it was able to muster in my system, and the fact that it’s the smallest, least expensive subwoofer JL Audio makes, I worry for the competition. Price: $799.99 USD; add $100 USD for Black Gloss finish.